A free problem solver suite for water treatment, wastewater, hydraulics, environmental chemistry and unit conversions. This tool is for estimating chemical quantity needed to disinfect tanks and pipelines. This Chlorine Dose Calculator spreadsheet allows the users to enter concentration and type of chlorine disinfectant, target chlorine dose, and dimensions of tank or pipeline (up to 10 vessels). This tool is for estimating chlorine disinfection CT in tanks and pipelines. This Disinfection CT Calculator spreadsheet allows users to enter the residual concentration, flow condition, and dimensions of tanks or pipelines. This tool gives a rough estimate of disinfection CT. For detailed design, additional safety factors and other considerations may be needed. 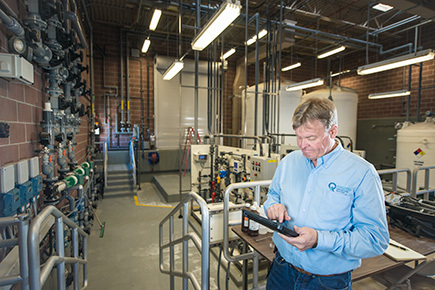 A tool that helps water systems write their own professional-looking Consumer Confidence Report. Enables water quality practitioners to better protect drinking water supplies. View the One-Page Fact Sheet for an overview. Monthly webinars, reporting tutorials, and other Drinking Water training.